This EKG comes courtesy of Dr. Smith and Dr. Ndubuisi. A 42 year old male with a past medical history of asthma, borderline diabetes, and ex smoker. Presents with complaints of left sided chest pain which began 2 days prior. The symptoms started with fever and coughing and then he developed the chest pain. The pain is worse with movement of his arms. He denies any SOB, wheezing, lightheadedness or syncope. V/S: P – 70, R – 18, BP 128/78, O2 say 98%. His lung and heart exam are normal. The EKG demonstrates ST elevations in leads II, III, aVF, V2-V6, I and aVL with PR depressions in lead II. This is consistent with pericarditis. Pericarditis is treated with anti-inflammatory medication and colchicine and follow-up with cardiology. Pericarditis can sometimes be difficult to differentiate from MI. They both present with chest pain and both can demonstrate ST elevations on EKG. They both can have elevated cardiac enzymes (if the pericarditis is associated with myocarditis). Differentiating them is important for several reasons. Pericarditis is usually self limiting and not dangerous. MI obviously requires acute treatment. One of the treatments for MI is anticoagulation. In a patient with pericarditis and a pericardial effusion, anticoagulation can be dangerous. Some clues on the EKG can help us differentiate pericarditis from acute MI. In general, MI should have ST elevations limited to one area of the heart (i.e. you should not have ST elevations in both the inferior wall and the anterior wall). In pericarditis there is generally diffuse ST elevations in many walls of the heart. MI often presents with reciprocal ST depressions. In pericarditis, you there should not be ST depressions except in leads aVR and V1. (This rule is not perfect either. There may be reciprocal depressions in myocarditis.) In MI the PR segments should be isoelectric. In pericarditis, you may see PR depressions. They are most commonly seen in lead II. You may also see PR elevations in lead aVR. Our patient had fever which is more common in pericarditis than in MI. This EKG demonstrates ST elevations in leads II, III and aVF as well as leads V2-V6, I and aVL. This diffuse pattern of ST elevations would not be expected in an MI. There are also PR depressions in lead II. This is consistent with pericarditis. He was treated with NSAIDs and referred to cardiology for follow-up. This EKG comes courtesy of our recent graduate Dr. Josie Acuna. 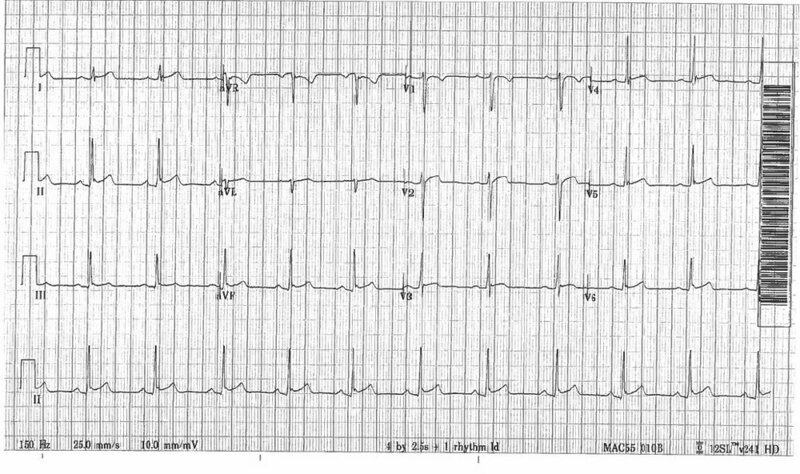 A 29 year old male presents to the ED complaining of chest pain. The pain is located in the center of his chest and is non-radiating. He also reports shortness of breath when he walks. V/S: P 102, R 18, BP 120/80. The EKG demonstrates ST elevations in leads II, III and aVF. There are also ST elevations in leads V1-V6, I and aVL. There are slight PR depressions in lead II and PR elevations in lead aVR. This is consistent with pericarditis. Several criteria have been proposed to differentiate pericarditis from acute MI but many are not reliable. In general, MI should have ST elevations limited to one area of the heart (i.e. you should not have ST elevations in both the inferior wall and the anterior wall). In pericarditis you should have diffuse ST elevations in many walls of the heart. MI often presents with reciprocal ST depressions. In pericarditis, you should not have ST depressions except in leads aVR and V1. (This rule is not perfect either. There may be reciprocal depressions in myocarditis.) In MI the PR segments should be isoelectric. In pericarditis, you may see PR depressions. They are most commonly seen in lead II. You may also see PR elevations in lead aVR. Our patient was young with absent cardiac risk factors. That may make MI less likely. The EKG demonstrates ST elevations in leads II, III and aVF as well as leads V1-V6, I and aVL. This diffuse pattern of ST elevations would not be expected in an MI. There are also slight PR depressions in lead II as well as PR elevations in lead aVR. This is consistent with pericarditis. An image from the patient’s echo is below. It demonstrates a pericardial effusion with no signs of tamponade.